New added to the foot of they account. " DRYDEN. In silence I’ll take my way’." GOULD. Having detailed the two patrols and the guard on Waschout Hill as already described, I spent some 20 minutes—whilst the stores, etc., were being arranged—in walking about to choose a position to hold in the light of my 19 lessons. I came to the conclusion that it was not any good being near the top of a hill and yet not at the top. I would make my post on the top of Waschout Hill, where I could not be overlooked from any place within rifle range, and where I should, I believed, have "command." I was not quite certain what "command" meant, but I knew it was important—it says so in the book, besides, in all the maneuvers I had attended and tactical schemes I had seen, the "defence" always held a position on top of a hill or ridge. My duty was plain: Waschoiit H ill seemed the only place which did not contravene any of the 19 lessons I had learnt, and up it I walked. As I stood near one of the huts, I got an excellent view of the drift and its southern approach just over the bulge of the hill, and a clear view of the river further east and west. I thought at first I would demolish the few grass and matting huts which, with some empty kerosene tins and heaps of bones and debris, formed the Kaffir kraal; but on consideration I decided to play cunning, and that this same innocent-looking Kaffir kraal would materially assist me to hide my defences. I made out my plan of operations in detail, and we had soon conveyed all our stores up to the top of the hill, and started work. Upon the return of the patrols with their prisoners, the Dutchmen and "boys" were told off to dig for themselves and their females. The Kaffirs of the kraal we had impressed to assist at once. My arrangements were as follows: All round the huts on the hilltop and close to them, we dug some ten short lengths of deep-firing trenches, curved in plan, and each long enough to hold five men. These trenches had extremely low parapets, really only serving as rifle rests, some of the excavated earth being heaped up behind the trenches to the height of a foot or so, the remainder being dealt with as described later. In most cases the parapets were provided with grooves to fire through at ground-level, the parapet on each side being high enough to just protect the head. As with the background the men’s heads were not really visible, it was unnecessary to provide proper loopholes, which would have necessitated also the use of new sandbags, which would be rather conspicuous and troublesome to conceal. When the men using these trenches were firing, their heads would be just above the level of the ground. Once these firing trenches were well under way, the communication trenches were started. ‘These were to be narrow and deep, leading from one trench to the next, and also leading from each trench back to four of the huts, which were to be arranged as follows, to allow men to fire standing up without being seen. Round the inside of the walls of these huts part of the excavated earth, of which there was ample, would be built up with sandbags, pieces of anthill, stones, etc., to a height that a man can fire over, about four and a half feet, and to a thickness of some two and a half feet at the top, and loopholes, which would be quite invisible, cut through the hut sides above this parapet. There was room in each hut for three men to fire. In three of them I meant to place my best shots, to act as snipers, as they would have a more favourable position than the men in the trenches below, and the fourth was a conning-tower for myself. All the tents and stores were stacked inside one of the huts out of sight. That evening, in spite of the hardness of the work, which caused much grousing among my men, we had got the firing trenches complete, but the others were not finished—they were only half the necessary depth. The earth walls inside the huts were also not quite completed. The Kaffirs and Dutch had deep pits, as before, in three of the huts. Ammunition and rations were distributed round the trenches the last thing before we turned in. I also had all water-bottle and every vessel that would hold water, such as empty tins, Kaffir gourds, and cooking-pots, filled and distributed in case of a long and protracted fight. Having issued orders as to the necessity for the greatest secrecy in not giving away our position should Boers turn up early next morning, I went to sleep with confidence. We had, anyhow, a very good position, and though our communications were not perfect quite, these we could soon improve if we had any time to ourselves the next morning. Next morning broke; no enemy in Sight. This was excellent, and before daylight we were hard at it, finishing the work still undone. By this time the men had fully entered into the spirit of the thing, and were quite keen on surprising Brother Boer if possible. While the digging was proceeding, the "dixies" were being boiled for the breakfasts inside four grass screens, some of which we found lying about, so as to show nothing but some very natural smoke above the kraal. I picked out one or two of my smartest NCOs, and instructed them to walk down the hill in different directions to the riverbank and try if they could see the heads of the men in the firing trenches against the sky. If so, the heaps of earth, tins, bones, grass, screens, etc., should be rearranged so as to give a background to every man’s head. Meanwhile the enemy’s scouts had advanced in much the same way as detailed before, except that after coming past Incidentamba Farm, they had not halted suspiciously, but came on in small groups or clumps. 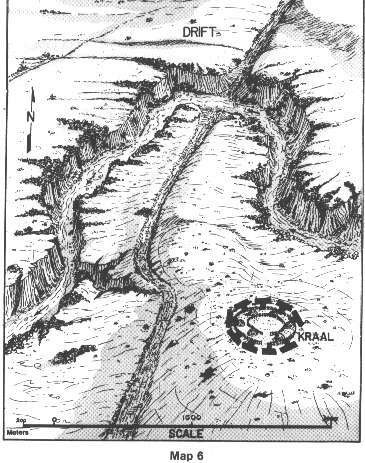 They crossed the river in several places and examined the bushy banks most carefully, but finding no "khakis" there, they evidently expected none on the open veld beyond them, for they advanced "anyway" without care. Several of the clumps joined together, and came on chatting in one body of some 30 men. Would they examine the kraal, or would they pass on? My heart pounded. The little hill we were on would, unluckily, be certain to prove an attraction for them, because it was an excellent vantage ground whence to scan the horizon to the south, and to signal back to the main body to the north. The kraal was also a suitable place to off-saddle for a few minutes while the main body came up to the drift, and it meant possibly a fire, and therefore a cup of coffee. They rode up towards it laughing, chatting, and smoking quite unsuspectingly. We uttered no sound. Our Dutch and Kaffir guests uttered no sound either, for in their pits was a man with a rifle alongside them. At last they halted a moment some 250 meters away on the northeast, where the slope of the hill was more gradual and showed them all up. A few dismounted, the rest started again straight towards us. It was not magnificent, but it was war. I whistled.